The Roman army used several different types of swords, but the one that struck the enemy with the greatest fear was the machiara. While the long swords they used in battle were effective in wounding the enemy, it was the dagger-like machiara that brought about an excruciatingly painful death. This double-edged sword used in close combat dealt a blow more severe than any other weapon available to the Roman soldier during Bible times. By using the word machiara when describing the sword of the Spirit, Paul, the author of Ephesians, is telling us God gave His church a weapon satan fears because it has the power to slash him to shreds! The use of the word machiara also tells believers that this sword of the Spirit we've been given will be used in close combat. Just a short stab is sufficient to do the enemy in! Of course, a Roman soldier didn't go onto the battlefield unprepared. He trained with his sword every day so when it came time for battle, he would be ready. In the same way, we must spend time in God's Word every day so we will be prepared for whatever the enemy throws our way. The Greek word logos refers to the written word of God, but that's not the word Paul used here. He defined the sword of the Spirit using the word rhema which is a quickened - or living - specific word from the Holy Spirit. You see, we're not in this battle alone - we have the Holy Spirit working with us! According to John 14:26, "the Counselor, the Holy Spirit, whom the Father will send in my name, will teach you all things and will remind you of everything I have said to you." Are you as excited about this as I am? Not only will the Holy Spirit help us understand what the Bible says, He will hand us our sword by bringing that Scripture to mind right when we need it! If I do my part and spend time studying and memorizing God's word, I can be assured God will do his part and bring it to mind when the need arises. The question we must each ask ourselves is, "Am I doing my part?" Lord, I thank you for the armor you have made available to me so that I will be protected and victorious when I battle against the enemy. Help me to put it on every day so that when the day comes I will be prepared. And thank you for the aid of the Holy Spirit, who is there to remind me of Your truth! 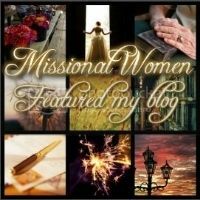 Linking up with: "Hear it on Sunday, Use it on Monday", "The Beauty in His Grip", "Soli Deo Gloria", "Playdates at the Wellspring", "Monday Musings", "Living Well Wednesday", "Word Filled Wednesday", "Weekend Whatever", "Spiritual Sundays"
Great reminder of all God does to prepare us for spiritual battle. I love this line: "Just a short stab is sufficient to do the enemy in!" Thanks for sharing this and for visiting me at Doorkeeper. Blessings! I love looking at the original Greek to get a better handle on what the text is saying! 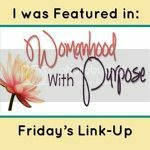 thnaks for sharing your insights! posting a portion on my fb and linking others to this. Lisa, this is fantastic! You did a wonderful job with this post. Sometimes on Fridays, I post links of articles that really touch me. This one will be definitely on the list. There is power in WORDS, and using the Word of God as a weapon against The enemy in what ever form he comes to us in, is our weapon of choice. Using God's word in prayer, in speach, in thought will keep us bolstered up. Awesome! I never had done a word study on the word sword. Loved this post! Thanks for sharing and for the encouragement!! I needed to see this and read your post today! My workplace is filled with Satan and it is all I can do to fill my heart and mind with God's word and His armor before I enter the office. But my heart is sad as our youngest son is off to college and he is 9 hrs. away! I would welcome prayer for us so somehow we can find more creative ways to visit him! I feel safer in His arms whenever I read Ephesians 6:11. It is a Scripture I repeat daily! I've always been more afraid of knives, swords, etc. - anything that "cuts" more than guns and bullets. 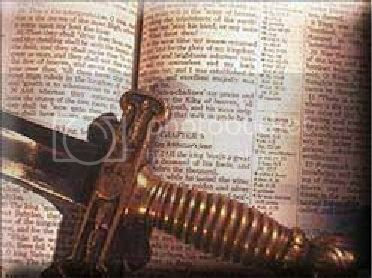 The sword of the Spirit is a valuable and necessary weapon. Thank you for sharing this. Last night a visiting pastor spoke about the machiara. It stirred me so much, I googled it and came upon your site. You confirmed almost word for word what you have written! What a blessing! WHERE DO YOU FIND STRENGTH?